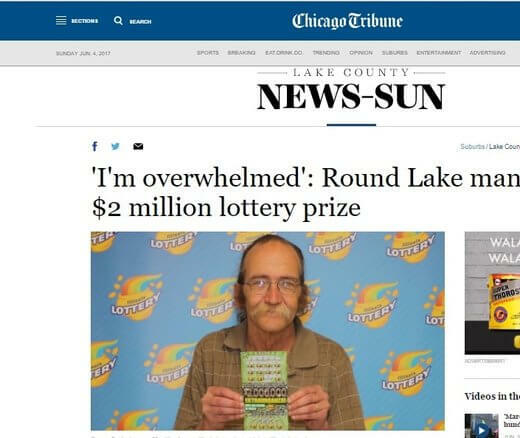 George Gaulke of Round Lake finally found lottery luck after he purchased an Illinois Lottery a $2 million Extravaganza! ticket for $20. Scratching the ticket revealed that it was a $2 million winner. Gaulke bought the winning ticket from the A & N Liquors, 34780 Catherine Road, Ingleside. He says he’s still overwhelmed by the size of his win. He wants to be very careful about his windfall though and says his priorities are settling debts and investing what remains. For him, the best part about winning is having peace of mind that comes with financial security. The store will receive 1% of the prize as a bonus for selling the winning ticket. The game features three top prizes of $2 million and six prizes of $100,000. One of each remain unclaimed.